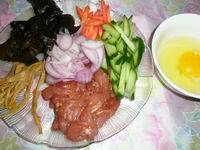 Muxu (Moo Shu, Mu Shu, Mo Shu) Pork Tenderloin Recipe is famous Chinese pork recipe from northern China. 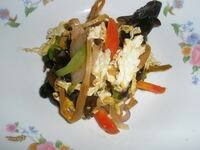 It contains black fungus, daylily and cucumber which help to reduce cholesterol, anti aging, nourish brain, etc. And of course, it's delicious with egg and pork tenderloin inside. 1. Soak daylily in cold water till soft(20mins). Wash 3 times with boiled water, drain well. 2. Soak black fungus in warm water for 30mins(or till soft). Change water 3 times during this period. Wash and drain well. Cut into small pieces. 3. Wash the pork tenderloin and cut into slivers. Mix with soy sauce and cornstarch. set aside. 4. Put a drop of water and beat the eggs until white and yolk mix up. Heat 1 tbsp of the oil in the wok to very high (till a slight smoke rise), add the mixed egg and stir-fry, till egg become solid. 5. Heat the rest 1 tbsp of oil in the wok to very high( till a slight smoke rise), add the pork slivers and stir-fry for 30 seconds, or until the meat is partially cooked. 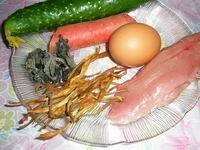 Add daylily, black fungus, onions, carrot, cucumber and fried egg and stir-fry for 30 seconds. Add SAUCE B, stir fry a few seconds to blend the ingredients. Tips: If you want it delicious you shouldn't put too less cooking oil in Moo Shu Pork recipe.